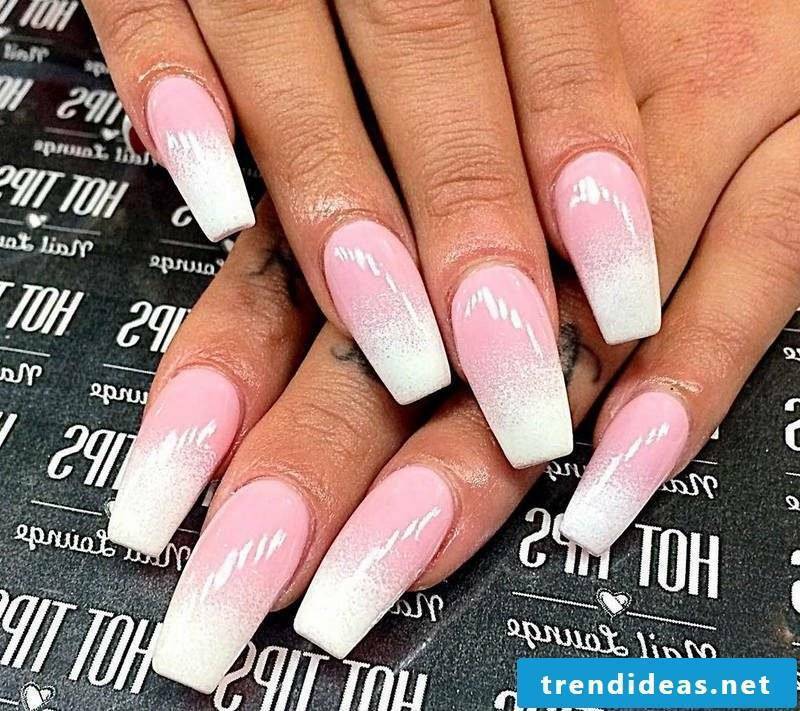 The first thing one notices to a woman is the nails. That’s why they have to be very well maintained and why not decorated with colorful and unique motifs? The latest trend in 2016 are the patterns. 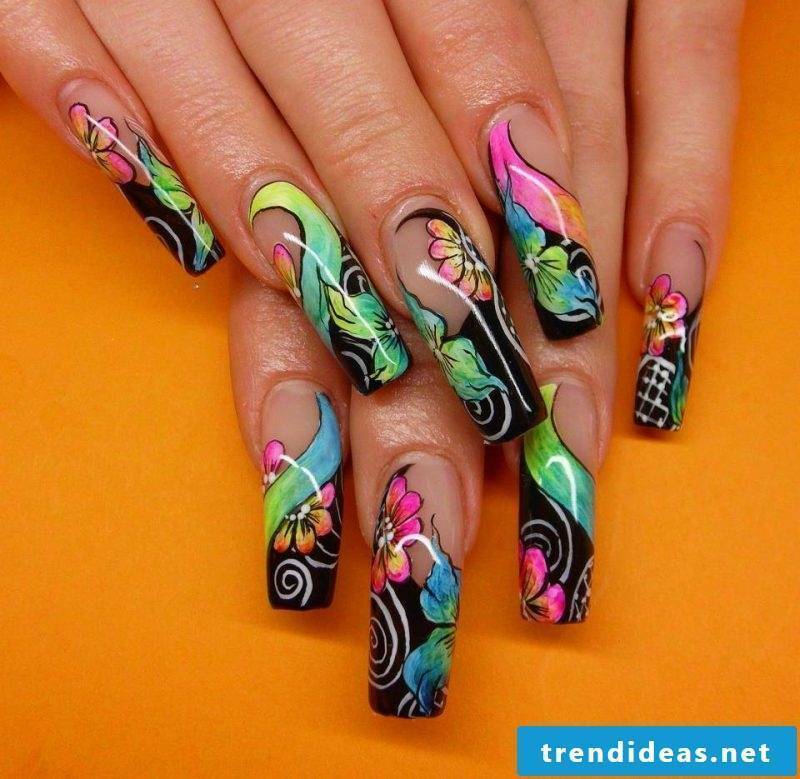 Whether colorful, linear, matt or with 3D motifs, every fingernail design fascinates with its own beauty. 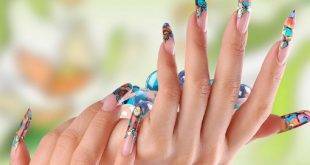 We have for you the diverse types of nail design collected at a glance. 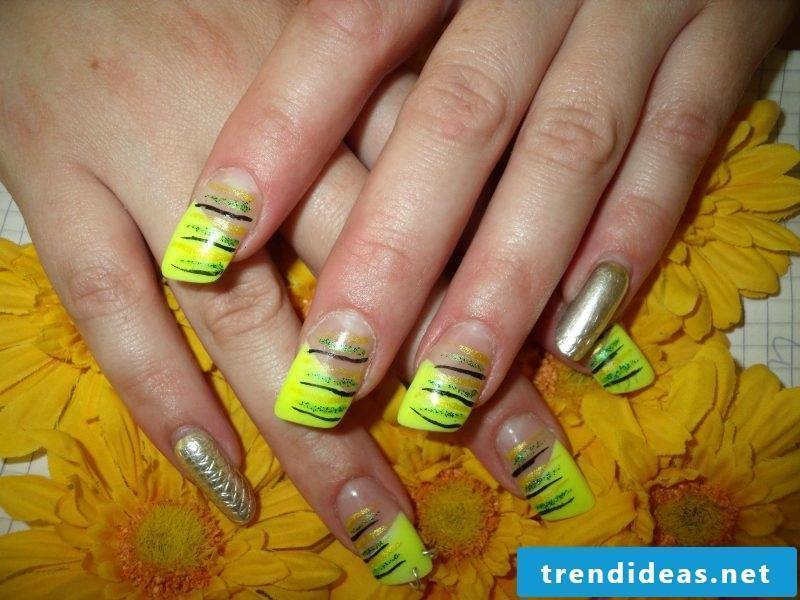 Get creative ideas from our picture gallery and complete your glamor look! 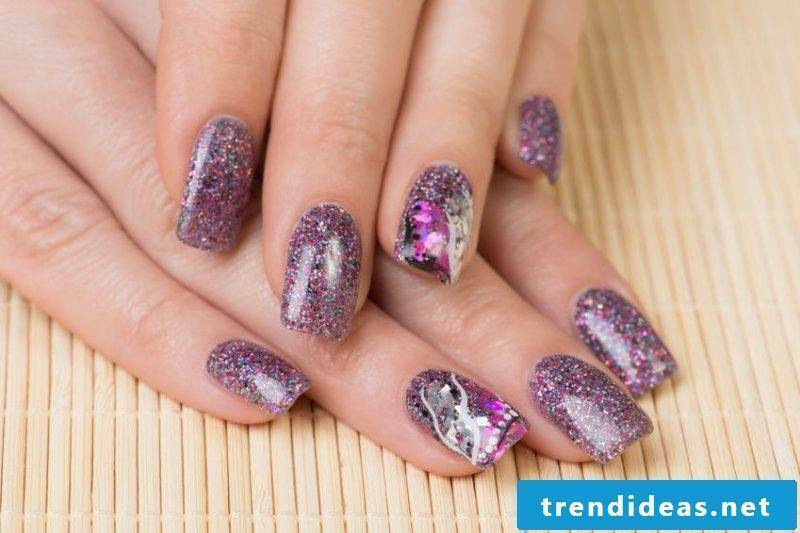 Choose Fingernail Design with Glitter and you’ll have your eyes open. 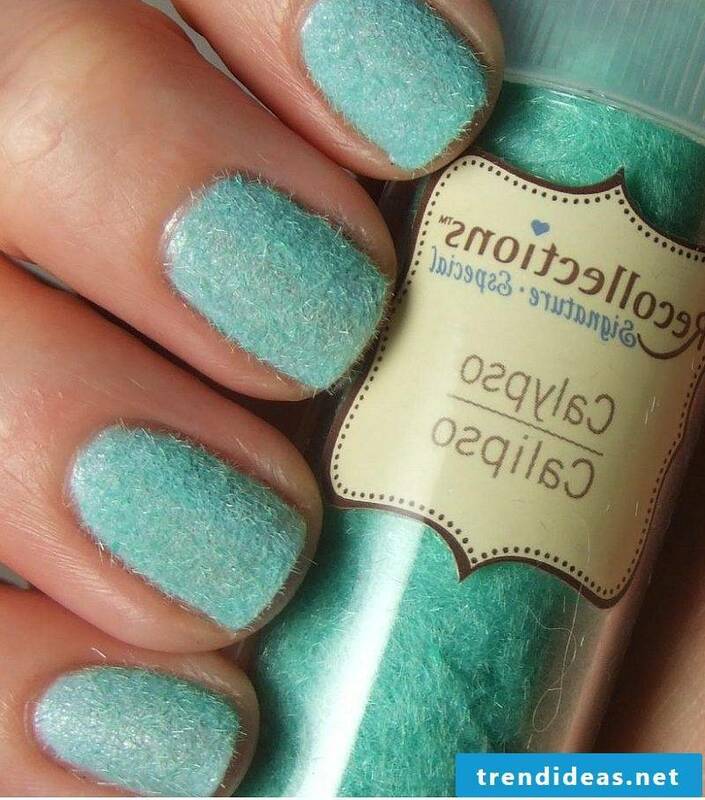 You do not use glitter for every nails, but rarely and with care, so you do not look cheesy. 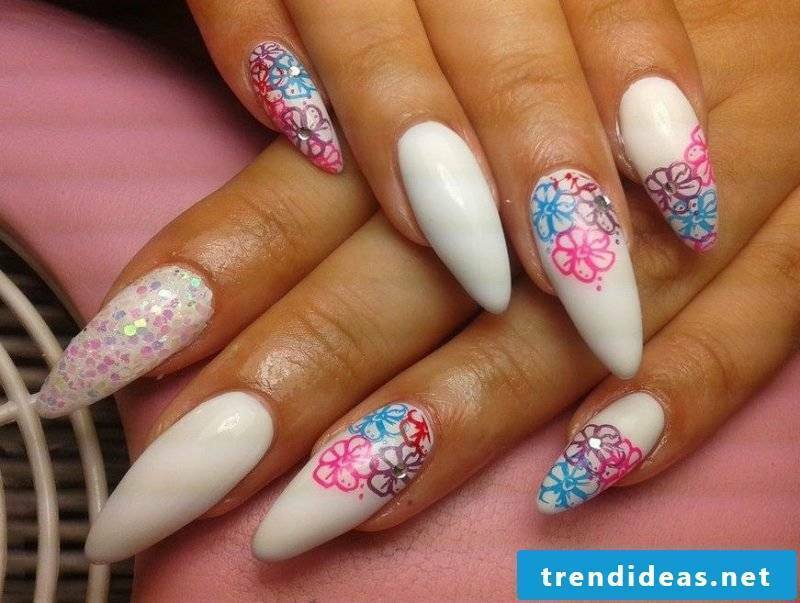 You can paint a whole nail with glitter or all but with small effective accents and shapes. 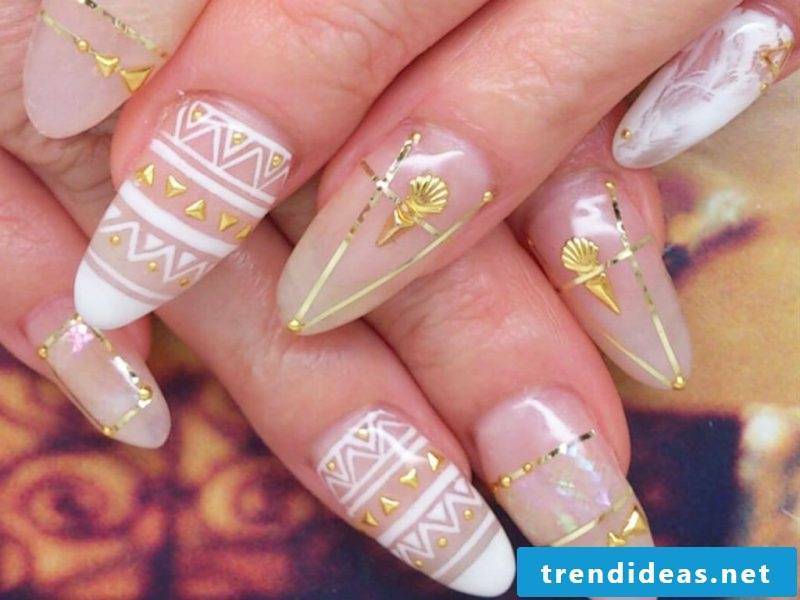 The gold or silver glitter is a trend this year. 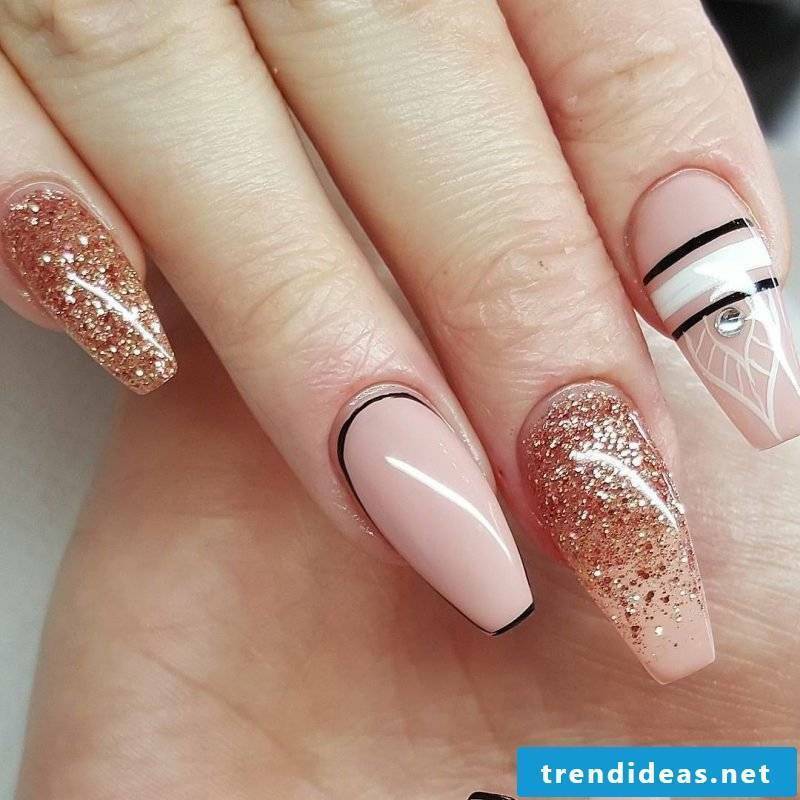 The nail design with glitter is just as suitable for parties as well as for everyday use. 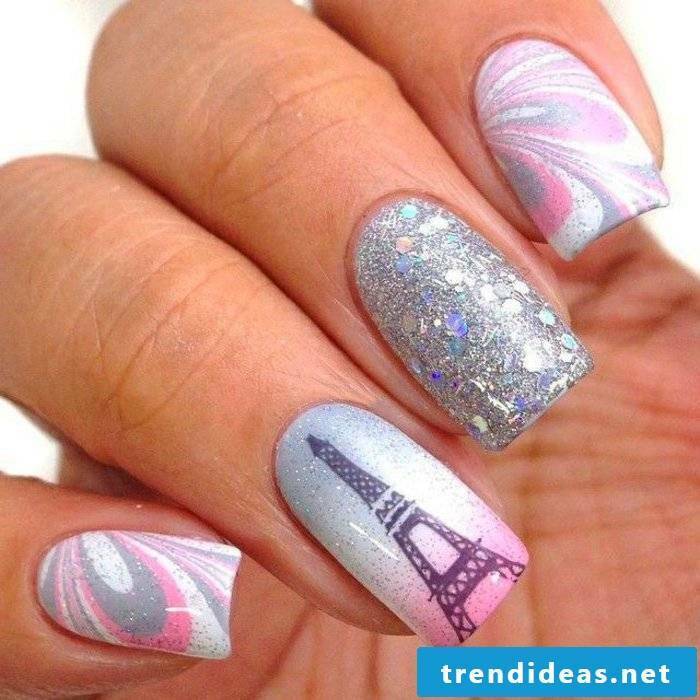 Use glitter lacquer to make french manicure or nail bed. It becomes very elegant and effective. 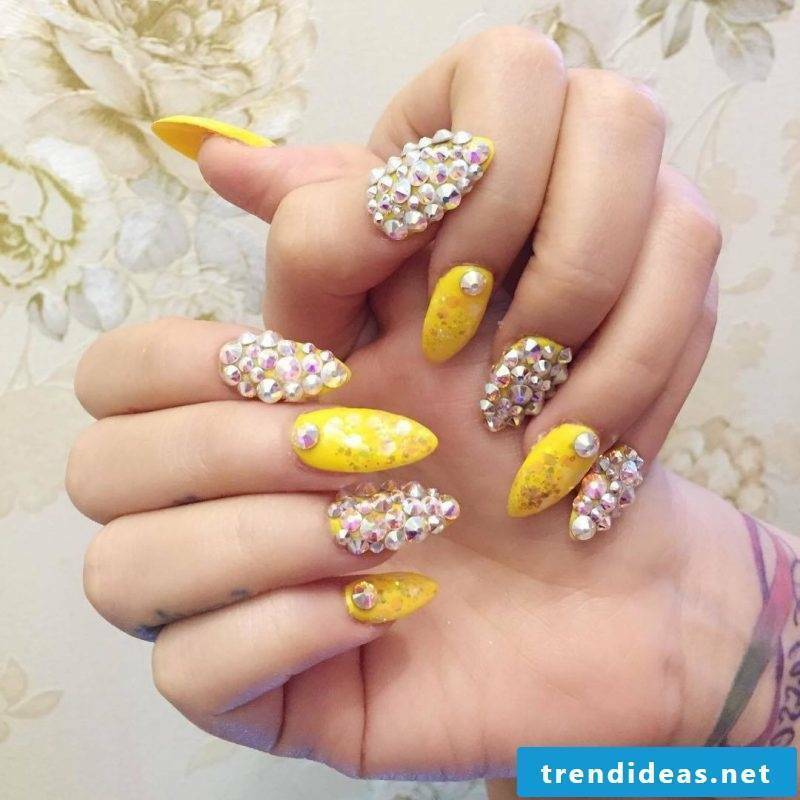 For winter, combine white nail polish with blue glitter, and for summer – yellow nail polish with golden glitter. 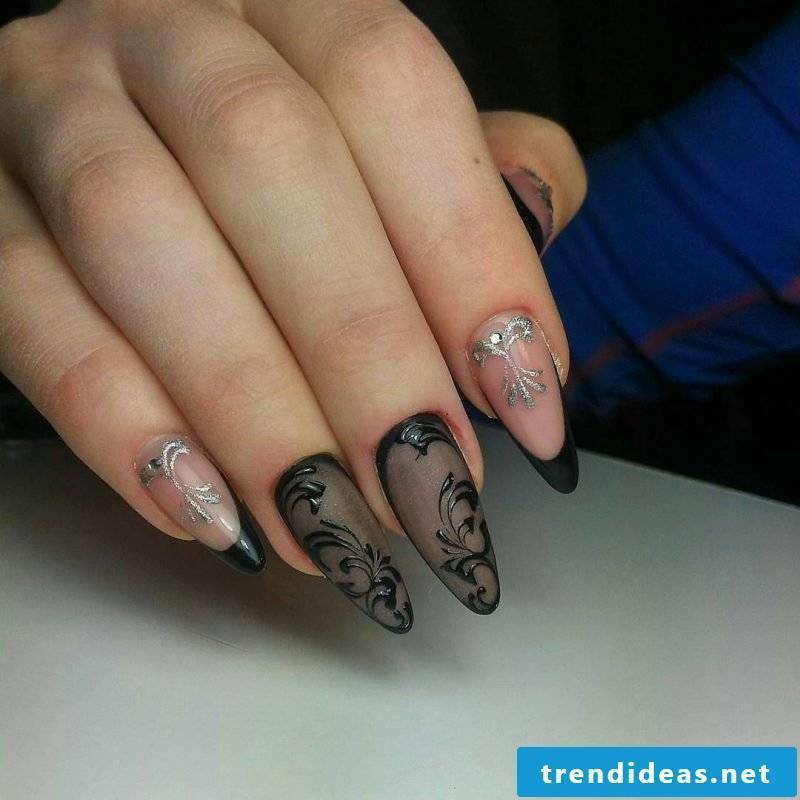 The 3D motifs are a big trend this season and also very popular in the fashion scene. 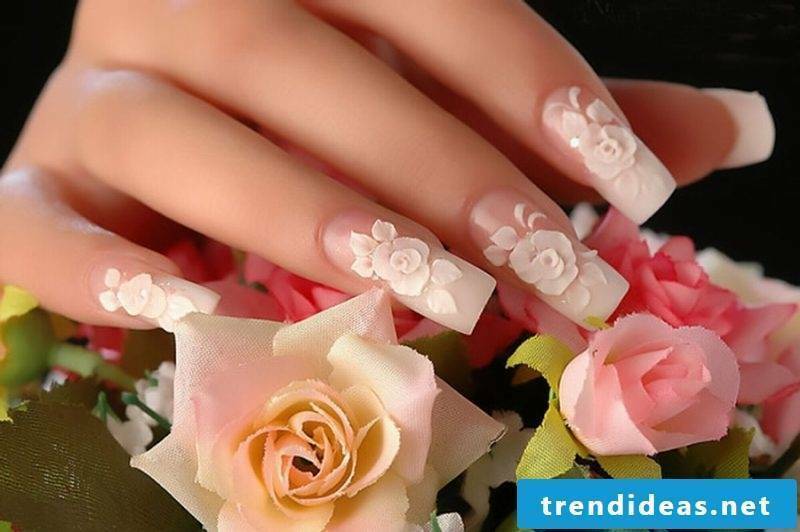 White 3D roses are the perfect choice for a wedding nail polish. 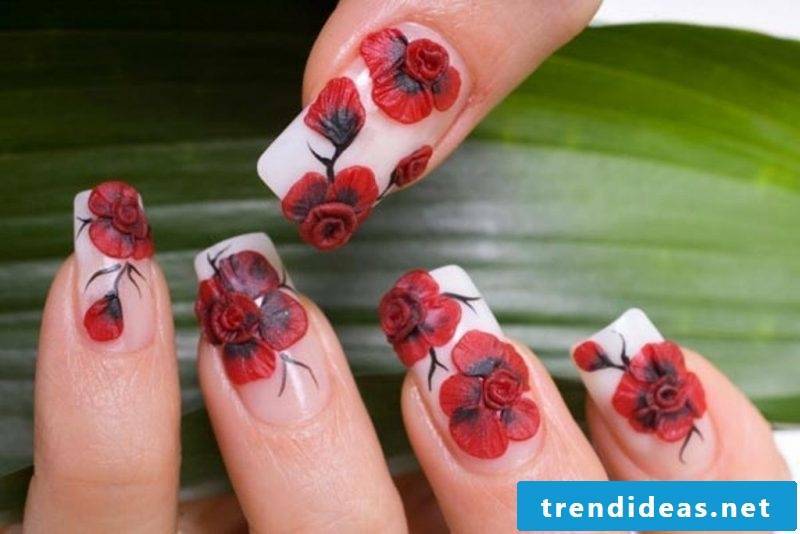 3D flowers can also be combined with stones for a glamorous look. But there is something important to know. 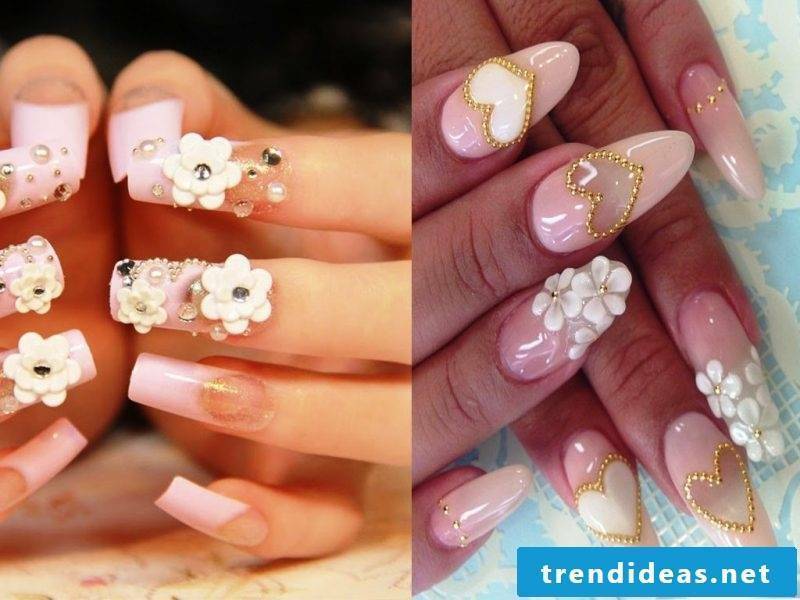 The 3D nail design is not that comfortable, but it’s worth it because it looks delicate and charming. 3D bows and hearts look very cute and fit any everyday outfit. For the summer you choose ornaments, such as shell or anchor. 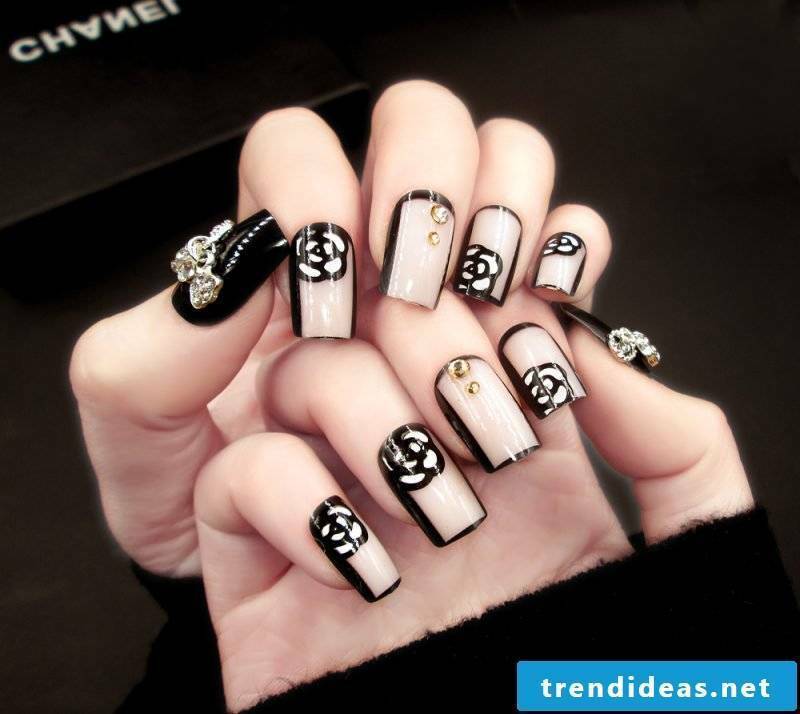 If you want to show elegance, choose the classic black color for your nails. 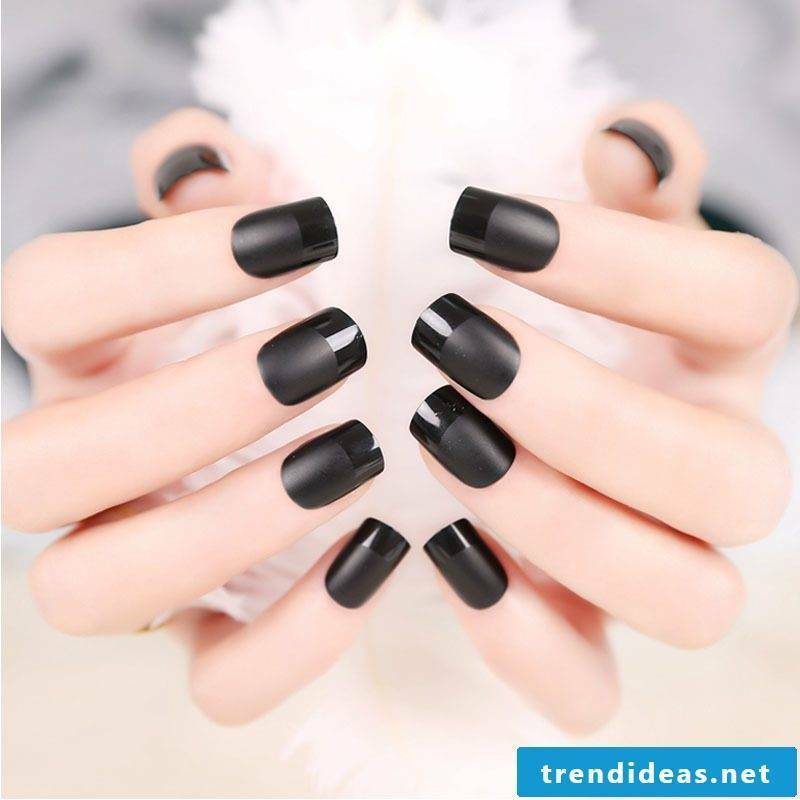 So that it does not look boring, choose the trendy black matte! The combination Gloss-Matt looks stylish. 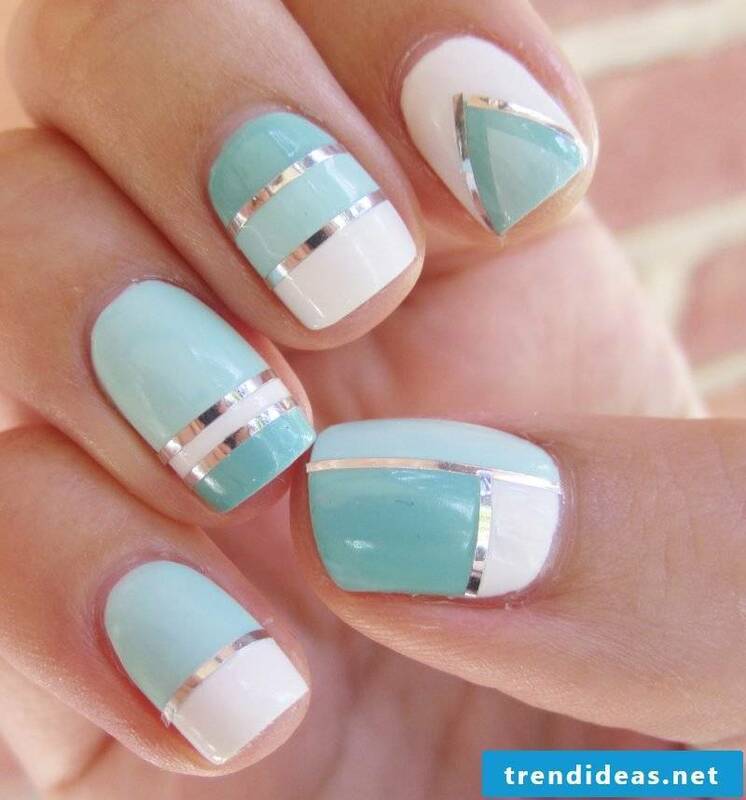 As a French manicure, you can combine shine and matt, or gloss over various ornaments. 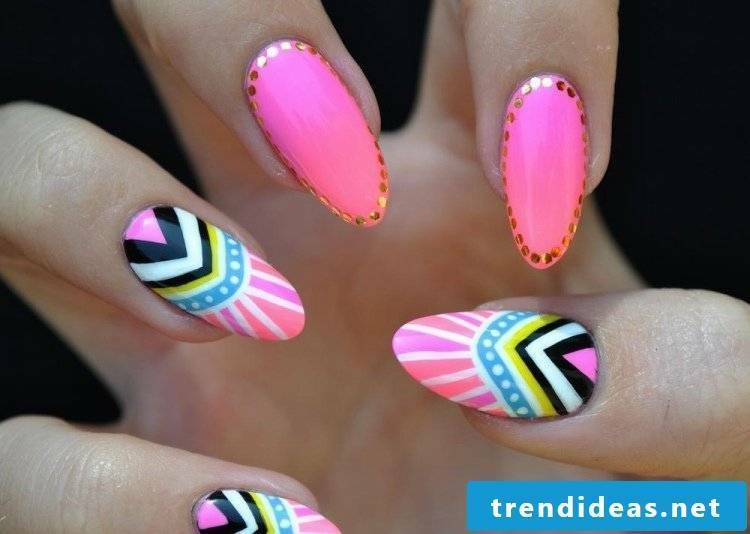 The matt nail polish can also make you very easy at home. 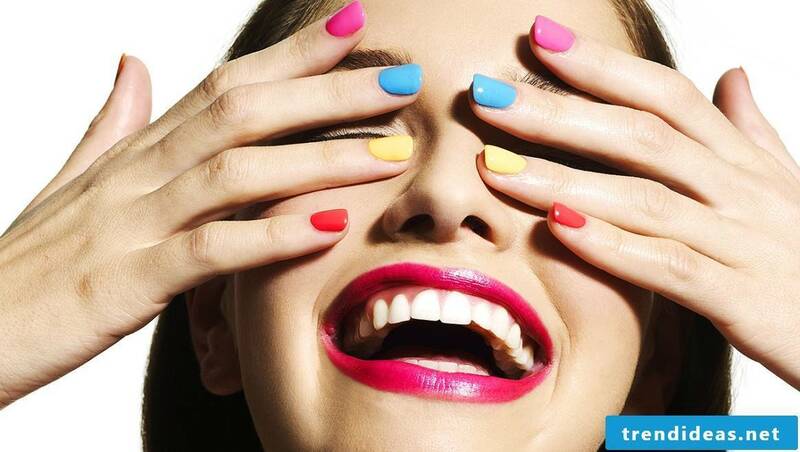 To turn the ordinary nail polish into a dull nail polish, use baking soda. You only need a small plate and a brush. 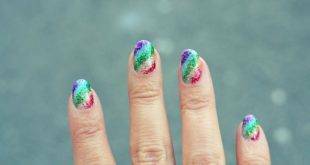 Squeeze baking soda on the nails, then paint and dip the brush into the baking soda. Brush the nails and place baking soda on your fingertips again. Then you can clean them easily. 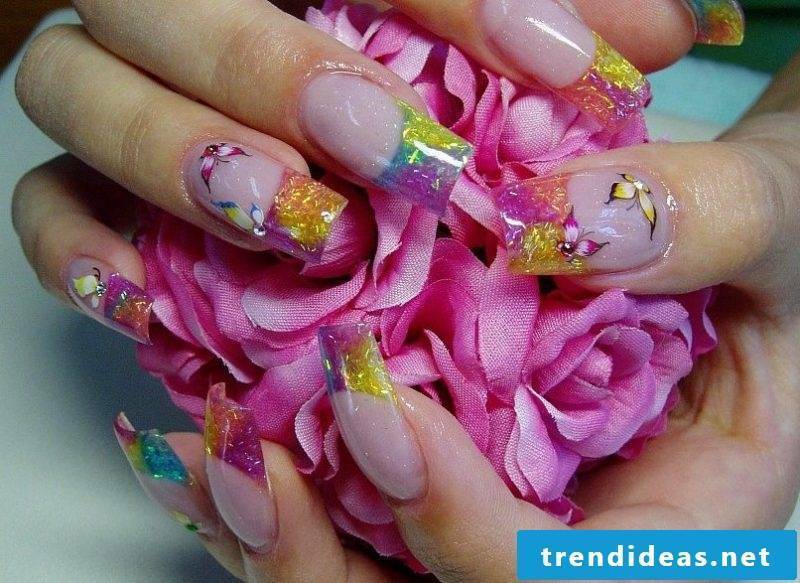 Nails with gradient look very romantic and are suitable for all colors. 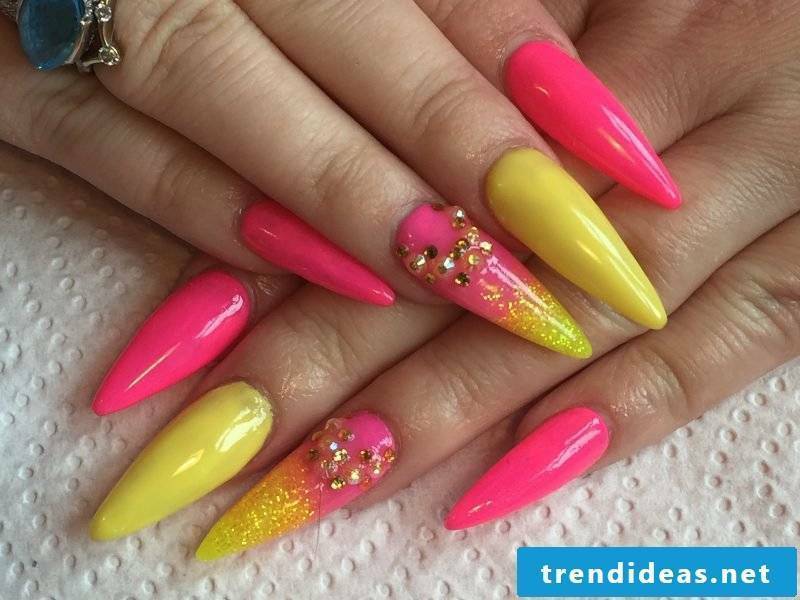 Ombré is the name given to the effect of two color gradients. Which colors you choose does not matter in the Ombré effect. It is not obligatory that the two colors are in one tone. Let your imagination run wild! 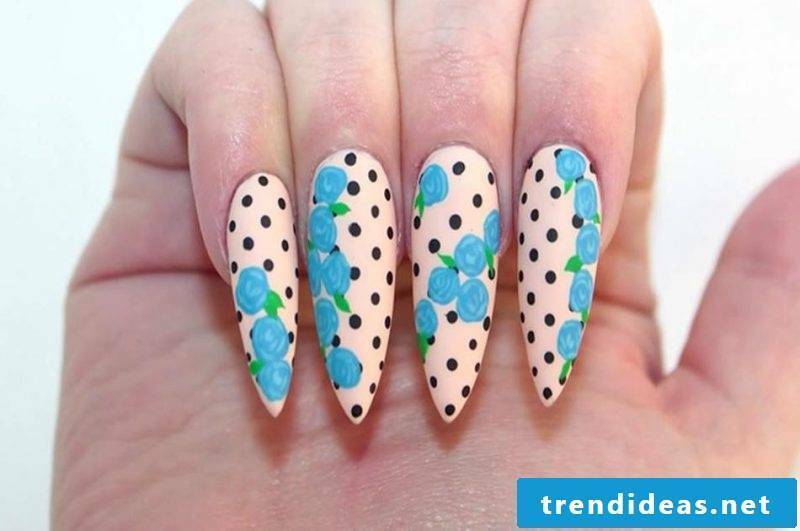 The great thing about this nail design is that it looks complicated, but you can also easily make it at home. 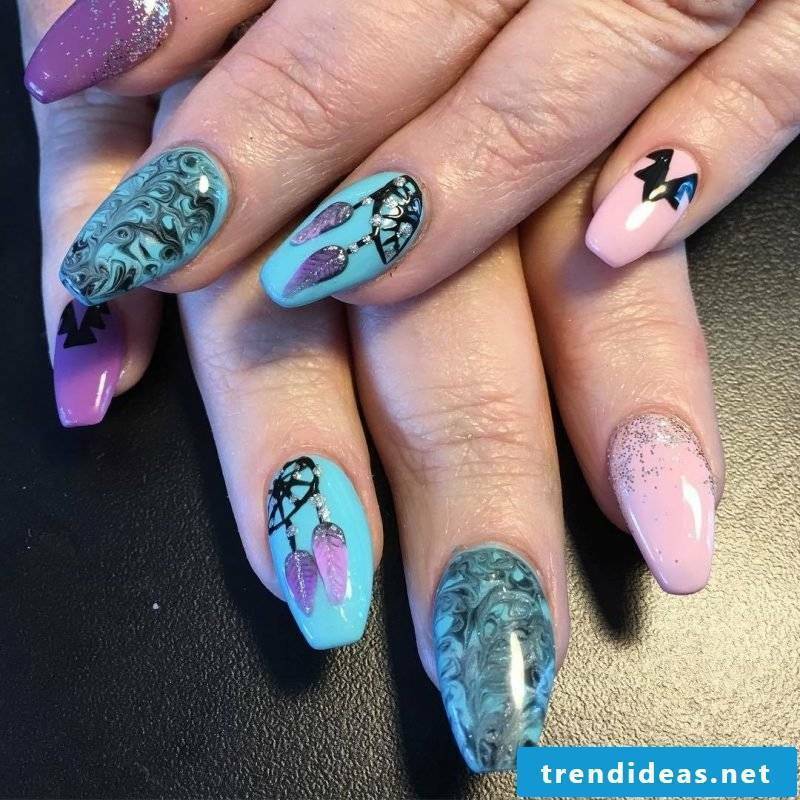 You can use Ombré effect for all nails or combine with other design, such as glitter. 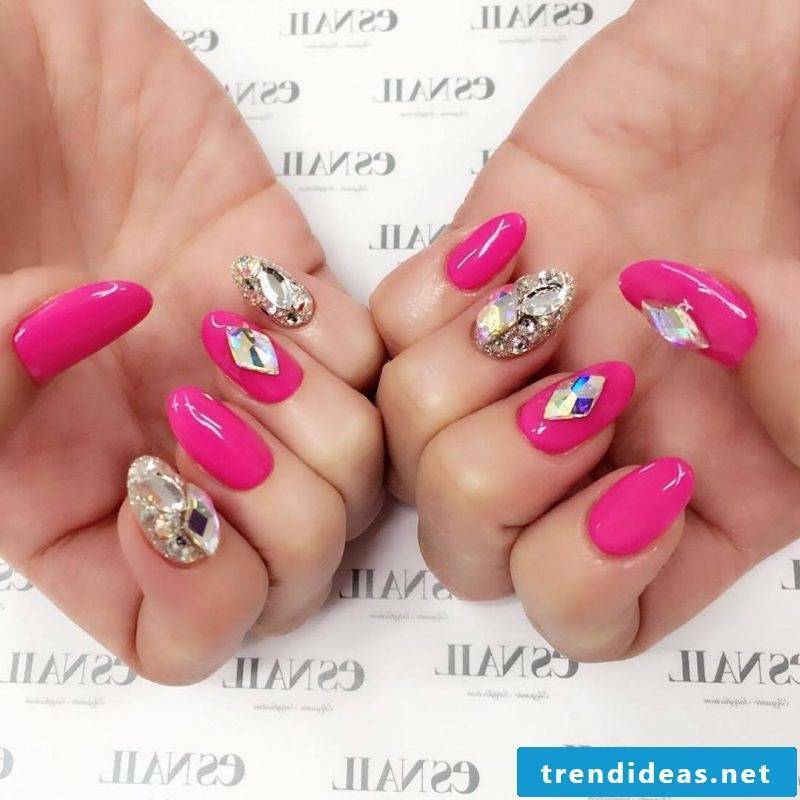 Small crystals or big stones – with the two variants you will look like a star! 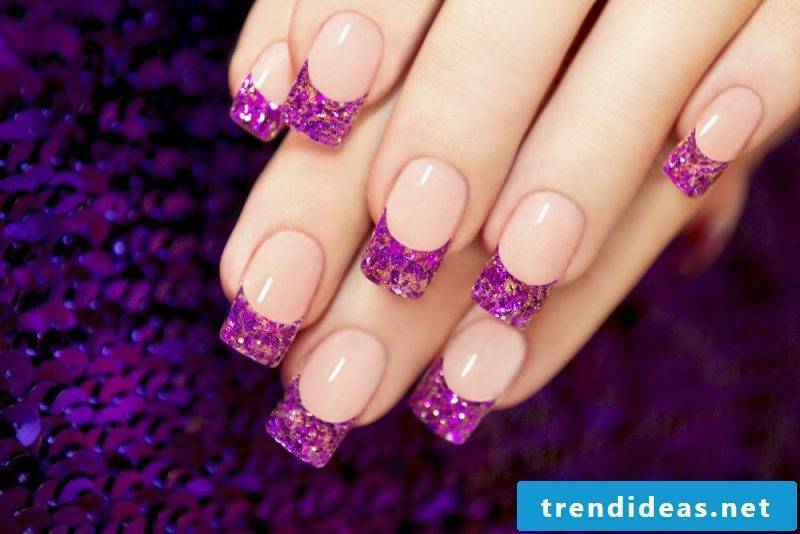 If you prefer delicacy on your nails, choose a design with tiny crystals on each nail. 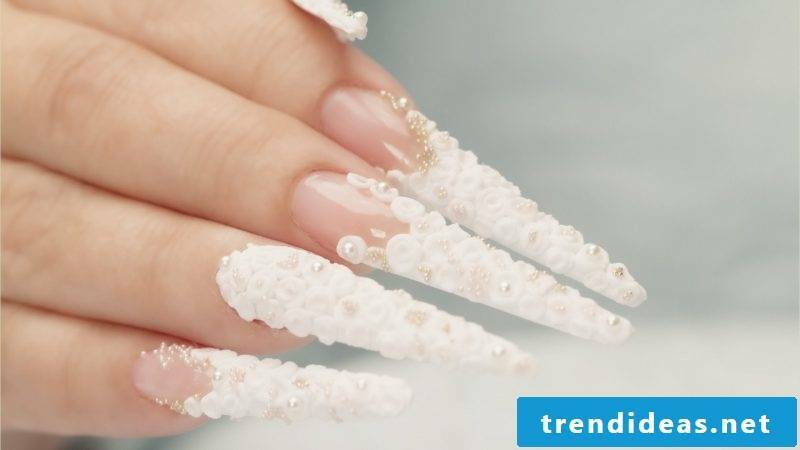 If you want to look more attractive and unique, experiment with a whole nail full of pebbles. 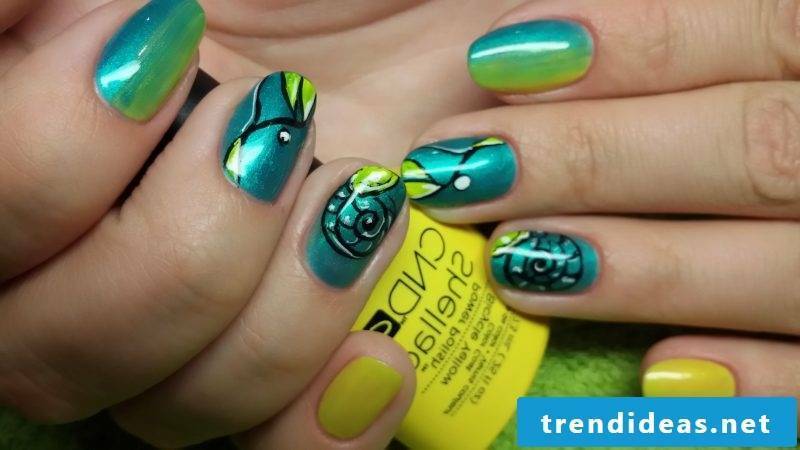 You can also decorate your nails with pearls. All ideas and designs can be combined according to your taste. Enjoy our picture gallery and you will find something suitable for you!